Eve and Once set up a world that was going to crumble before things could change. Rise is that crumbling. Eve is married to Charles, unhappy and anxious. She is silently working for the rebels from within the castle. The death of Caleb strengthened her resolve and she’s not going to let anything stand in her way. I didn’t mind Charles. He wasn’t a villain, but he wasn’t a grand hero either. He played his part well and it was obvious that he cared for her in some capacity. I wish Eve had given him the chance to be friends that they deserved. Eve takes action in this novel. She’s one the move and has to make decisions quickly, thinking through the outcomes as far as she can, but still not knowing entirely if she’s right. There are some deaths in this novel and each one hit hard. Eve’s ability to keep moving even though everything around her seems to be stopping is something I admire. The supporting characters play an important role in this book. Characters that hadn’t been involved much become key players and without them, Eve would have failed at some of things she needed to do. Without getting into spoilers, there are a few scenes that would have ended the book if Eve did not have support. I’m glad Carey made it a team effort at times. One individual cannot do everything alone, but with help and support, anything is possible. 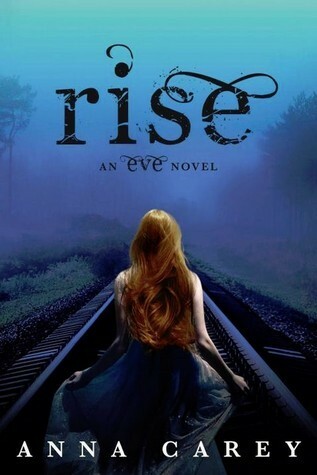 Rise is the third series finale I’ve read in a row. Like Requiem the ending is left open, but it works. There’s enough of an ending that I feel closure. I don’t know where the characters will end up, but Rise still felt wonderful. I’m glad the Eve series ended the way it did. This entry was posted in Dystopia or Post-Apocalyptic, Young (and New) Adult and tagged Anna Carey, Dystopia/Post Apocalyptic, Science Fiction, Young Adult. Reblogged this on Dystopia Capitol.